Callooh! Callay! I finished my drawers tonight, stitching down the inside of the waistband, sewing on three buttons, and making (shudder) three buttonholes. Shell buttons, made on an antique, though I doubt mid-19th century, press. They are arranged in a slanted fashion to accommodate my curves throughout this very wide (1.5 nails or a little less than 3.5 inches!!) waistband. 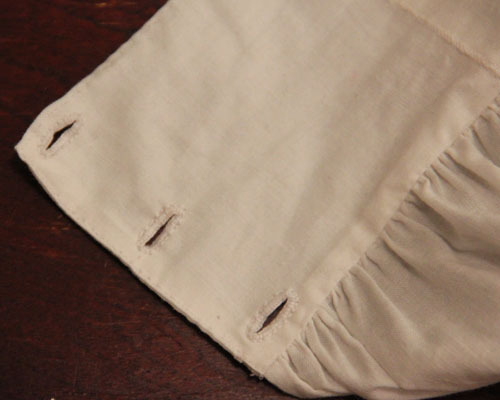 Miserable, wretched buttonholes (I abhor buttonholes). 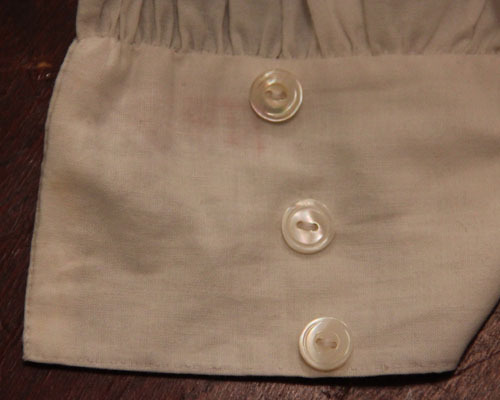 Worked according to directions from the Workwoman’s Guide, which suggested that sewing around the edge of the buttonhole adds a nice effect. I am not entirely sure I agree — looks a bit sloppy to me. In celebration, I am doing something very daring: presenting pictures of myself wearing split leg drawers, and nothing else. Forgive me if I shock the more timid among you with my excessive boldness. Please pardon my messy house and enormous feet. And a close up of my Broderie Anglaise frill. I found I was unable to abstain from sewing for an entire day, so this afternoon, while my conscience was taking a nap, I finished the edging on my drawers. Now all that remains is to cut and attach the waistband, complete with button. 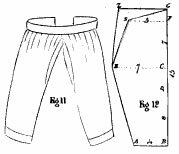 I’m going to stick to the basics as laid out in the Workwoman’s Guide and make a straight waistband. 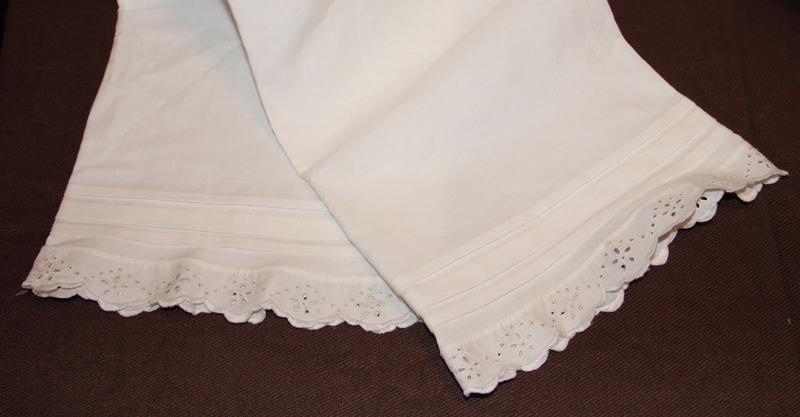 I think I may try a yoke on my next pair though, a la Godey’s 1850s. In other news, I have despaired of finding time to visit Steinlauf & Stoller in person (ridiculous, as I live less than 2 miles from the store, but their hours are weekday only) and decided to order the steel for my busk and other findings needed to complete my stays from Lacis. I also ordered three different sizes of coton a broder, which seems to be the preferred thread for Broderie Anglaise embroidery. Now back to my New Year’s resolutions and all the elegant entertainments we have planned for this evening. Should old acquaintance be forgot? I should say not! I am now officially halfway done with my embroidered petticoat frill, and felt I deserved a little time off. So I opted to cut out a new pair of drawers. Even though it’s from 1838, I used the Workwoman’s Guide pattern.